#8: Noticing an uptick in Foursquare friend requests lately. This is an issue that I simply cannot wrap my head around. Spec work appears in the design field infinitely more times than any other industry. It absolutely floors me that people think that it is even remotely ethical to build their businesses by tearing down ours. These design requests are often for logos, but for a number of other types of initiatives as well. For example, 99designs’ list of requests (to the right) gives some sense of the types of projects. So far, so good, right? Well, a lot of designers think not. As Mark Hemmis’s comment above shows, these open spec work contests have been raising the ire of the designer community. Is crowdsourcing ripping their industry asunder? The problem is, spec and crowdsourcing can lower your value and hourly rates so far that minimum wage looks like a fat paycheck. Her statement takes things to a logical extreme – someone would have to do nothing but spend their time entering contests. But she does a good job framing the issue. Logo design contests are great, its the only way I go. I get my pick of 5-10 designs for less then $20. Designers these days are a dime a dozen, be happy you get the work. The design industry has characteristics of being craftsman, as well as strategists. At least the higher end firms do. Sentiments like that are grating. Design contest sites are not the future of graphic design… nor do I see a time when it ever will be, however, in the long term I believe spec work is going to be detrimental to the design industry… both devaluing design and designers as a whole. 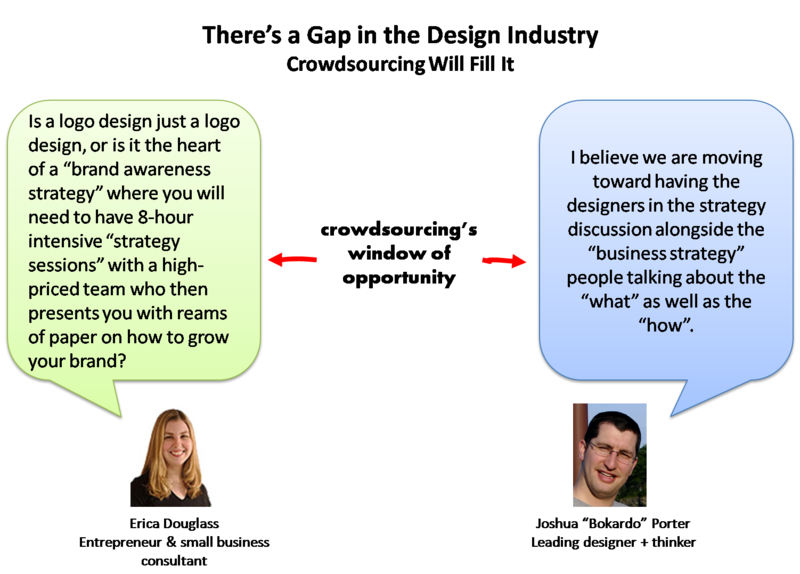 The argument here is that rather than expand the pool of talent for design, crowdsourcing will ultimately reduce the industry. Why Are Crowdsourcing Design Contests Growing? Truth is – 99designs is growing by leaps and bounds. We have record numbers of projects being launched and have needed to hire new staff to help us keep up with the growth. The motivation of organizations seeking design work seem clear enough – tap a large network of creativity, manage expenses within budget. But what are those designers doing there? It seems that not all designers are of the same mind about these crowdsourcing design contests. Some actually embrace them. Why? Personal interest: Some projects just pique the interest of a person. Maybe there’s a day job with a paying company, and then a chance at night to do things “your way” on a project of interest. The project taps some areas you want to pursue, or maybe allows you to try something out without concern as to whether the client will ultimately want the design. Extra business: Everyone is hustling in a weak economy. If your design business has some slack in demand, why not apply the available creative resources toward an occasional crowdsourcing project? If you’re a professional shop, presumably your odds are better than most. Access to high-end ad agencies: This was the case when Porter Crispin + Bogusky solicited logo designs for their start-up client Brammo, maker of electric motorcycles. They ran the contest through crowdSPRING. The contest sparked plenty of debate, but also saw 700 entries. One reason was that young up-n-coming designers wanted the chance to impress a firm of the caliber of PC+B, who can send many paying clients their way. As a designer… crowdsourcing scares me. I think it has to do with the harsh reality that sometimes it doesn’t take experience or a big title to design something truly amazing. What’s the staying power of the crowdsourced design contest approach? And will it disrupt the industry, in the Clayton Christensen sense? Altimeter Group’s Jeremiah Owyang wrote last year, “Without a doubt, Specwork (like crowdspring or 99 designers) is here to stay – economics will drive this forward.” For the buyers, yes. But the supply side of the equation – the designers – is that here to stay? In a 2009 article, Forbes noted that there are 80,000 free lance designers in the U.S. alone. Add in the talent from around the world, and you can see that there is a large of pool of creativity. Maybe 200,000 designers globally? 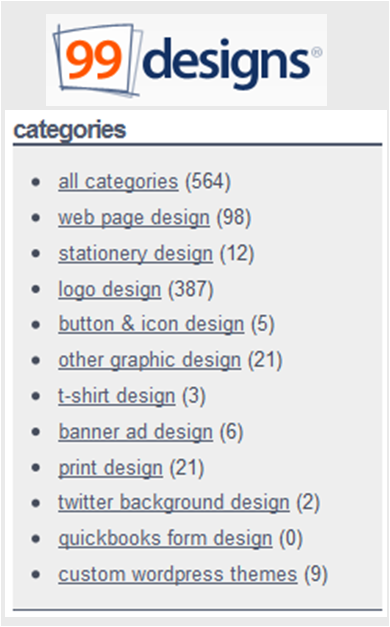 99designs claims roughly 54,000 designers on its site. Designers have some motivation to participate in crowdsourcing design contests, as noted for the reasons above. It’s not like every designer will submit regularly. But every project reaches some new set of designers, and occasionally gets a repeat one as well. All it takes is for a business seeking design work is maybe 30, 40, 50 submissions? As a percent of the global number of designers, that’s not much. I’ve had direct clients and also have been one of those in the crowd. Surprisingly, some of my best clients are the ones that followed me from these crowd sourcing sites. That’s probably because they’ve already been through a working process with me, and they like what they’ve experienced, so there’s no mismatch of expectations like a new client. I do see the sustainability of the business. It’s complex, but there are enough people who do see advantages to participating. Even if only for certain periods of their lives or only on occasion. 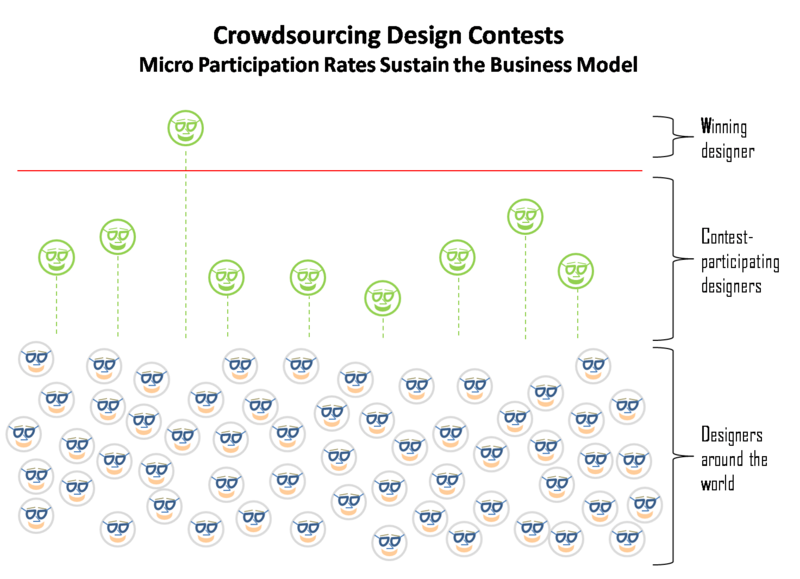 I don’t see entering crowdsourcing design contests as a full-time pursuit for someone. Many designers in the debate note the importance of establishing a rapport with clients, and understanding their clients more deeply than a set of colors and fonts. A firm such as Nocturnal Graphic Design Studio appears to deliver value through deeper relationships and more strategic approaches with its clients. Of course, this may not be contained to SMBs. Mountain Dew is asking consumers to choose three new sodas, from selecting the flavors to naming them, designing the cans and choosing the ad agency to promoting the product. Not all of this is crowdsourcing design, but it is an edgy experiment in leaving the professional firms behind. Right now, as Steve Douglas of the Logo Factory notes, the biggest chunk of business is for logos. Which you can see at the start of this post in the 99designs project list. The U.S. Census Bureau had the graphic design industry generating $2.8 billion in revenue in 2002. It is a large, diverse, complex industry. My expectation is that design contest crowdsourcing will encroach more into large enterprises for tactical projects, as the smaller businesses continue to use them and get good results. Large companies’ efforts, such Mountain Dew’s DEWmocracy, Unilever’s crowdsourcing contest for a TV campaign for its Peperami snack food, and Doritos’ crowdsourced Super Bowl ads, add fuel to this. Leaderboards let prospective buyers know who the best are. We see them on Topcoder for programming contests. It’s a way to establish visibility and credibility far beyond the recommendations you maintain on your own site. It will take some changes by the crowdsourcing sites, enabling recognition for designers who do well in contests, even if they are not picked. It also would need to have different bases for identifying top designers. The other wrinkle is to allow a form of smartsourcing. Once the top designers are identified, they are invited for larger companies’ design projects. This is pretty similar to the current state of things, except the basis for access changes somewhat. It’s not just business relationships a designer/firm has established with the big ad/marketing.brand agencies. It’s based on performance. With these two elements, I can see how crowdsourcing becomes more important, more disruptive, in the world of business design. #1: Twitter’s location information would come in handy during the Olympics. Choose to follow tweets of only those in your time zone. #6: RT @mvandall MIT-Sloan 4 keys to driving innovation: Measurement, experimentation, sharing & replication. http://bit.ly/cH9khC. Spigit got it right! In a recent interview with EMC’s Stu Miniman about the future of the web, I predicted that in 20 years, we’ll all have online reputation scores. Little badges, numbers that communicate our level of authority, this sort of thing. And these reputations will have tangible impact. It’s helpful to discuss each one, in the context of online reputations. eBay, which went public back in 1998, played an important role in socializing the concept of people providing online ratings for online sellers. After we receive our purchase, we rate the seller. The collective wisdom identifies top sellers. Got your eye in that Donkey Kong game? Who are you most likely to trust…? Amazon picked up on this, once it introduced third party sellers into the mix. You can see the percentage of positive ratings for the different sellers. Personally, I have paid premiums (i.e. higher prices) for the assurance that comes from a higher rated seller. Yelp has taken this concept of rating a seller, and applied to offline consumer experiences. Want to get a burrito in San Francisco? You’re likely to go with the highest rated restaurants. These ratings make up for our lack of information about various providers of services. One could do a lot of online research, and asking friends, before buying. But these ratings do quite well as shorthand ways of assessing quality. They’ve made it easy to transact, without knowing someone ahead of time. The rating ethos is expanding. On Facebook, you can ‘like’ people’s entries. We ‘love’ music on Last.fm. We ‘favorite’ tweets. We ‘digg’ and ‘buzz up’ stories. Implicitly, we provide ratings when we share content via different social networks. Online engagement allows for this. For workers, the growth of Enterprise 2.0 continues. A key outcome of that? More and more work is making its way online. When it’s available there, and not just in a Word document on the hard drive or email in an inbox, it’s findable and usable by everyone.Your colleagues know quite well what the quality of your work and contributions are. Do you think all of this stops, and we go back to message-relaying marathoners, smoke signals and carrier pigeons? No. Enterprise 2.0 and social media will continue their growth apace. 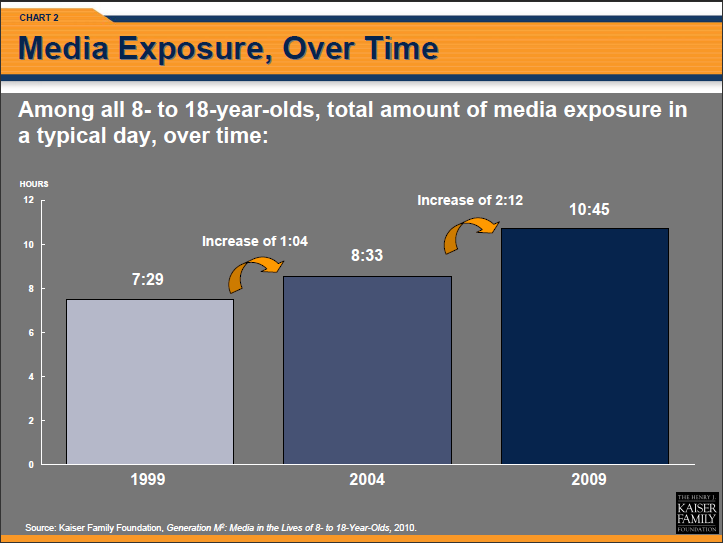 And increasingly, this time spent online is through social media. More and more people will be publishing their work, their ideas, their knowledge, their conversational bits, their creativity…online. It’s just going to keep increasing. An emerging trend is the transition of where we seek information. Remember libraries, magazines and microfiche? Then the 1.0 websites where we got information? Then the portals that aggregated information from major media sites? Then search augmented all this information consumption? If the news is important, it will find me. Admittedly, the leading social sites of today – blogs, Facebook, Twitter – have a ways to go before they become a large percentage of the population’s first choice. And it’d help if Twitter could get their search working further back than a week or two. But this survey and anecdotal evidence points toward an increased reliance on others to provide information to us. 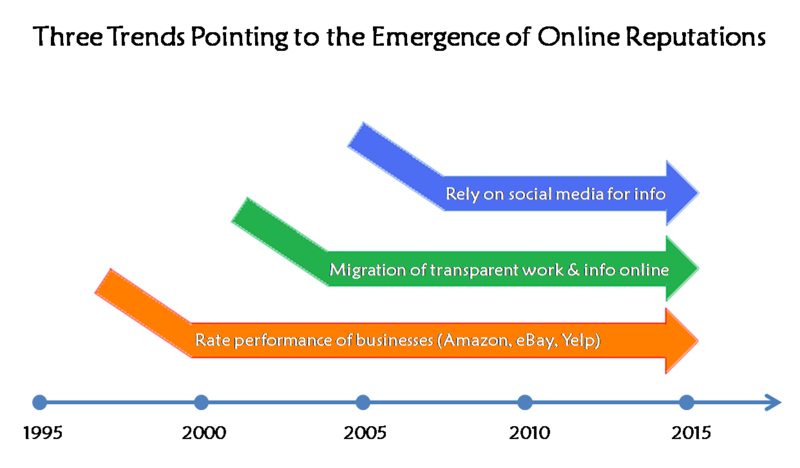 It’s that last trend, still early in its cycle, that really points toward the development of formal, online reputations. When we started transacting online with complete strangers or small businesses we never knew, we needed a basis for understanding their credibility. It turns out, crowdsourced ratings are excellent indicators of quality. It also causes small businesses to be aware of the quality of their products and services. 57% of U.S. workers use social media for business purposes at least once per week. 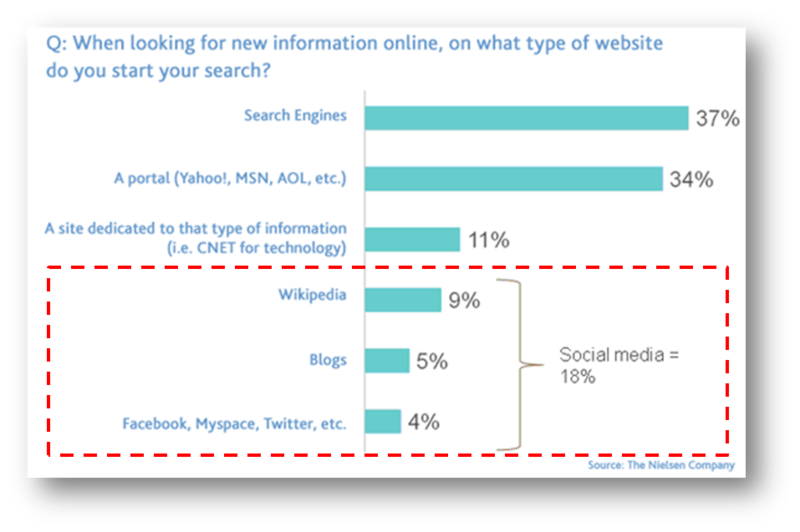 The number one reason cited by U.S. workers for using social tools for business purposes was to acquire knowledge and ask questions from a community. As reliance on people for information increases, expect an increased need for knowing which strangers provide the top quality information. Note I said “strangers” there. One thing we will continue to do is to rely on our “friends” (social media sense of the word) for ongoing daily information. The people we connect with on the various social sites. “You earn reputation, and then you give reputation. If lots of people follow you, and then you follow someone–then even though this [new person] does not have lots of followers,” his tweet is deemed valuable because his followers are themselves followed widely, Singhal says. It is “definitely, definitely” more than a popularity contest, he adds. Note his words: “You earn reputation“. PR agency Edelman created a ranking algorithm called Tweetlevel, which analyzes people on the basis of influence, popularity, engagement and trust. Tweetlevel was recently used to create a list of the top analysts on Twitter. As the author of that post noted, one purpose for the list was to answer the question: “Should they spend their limited time interacting with analysts via twitter?” Presumably if you’re an analyst in the Top 50, ‘yes’. Again, reputation being used for a defined purpose. Use internal social networks to build a kind of marketplace that would put work capacity and competence on a given subject in relation with needs and allow those who can apply for an assignment instead of blind assignments to those who can’t. In a world where individuals emerge as important sources of information, products and services, people will need a way to break through the limited knowledge they’ll have on any one person. Look for online reputations to emerge as a way to fill that gap. #3: One thing we’ll see more in next 20 years: online reputations. Not just businesses, but people. Formalized and applied to web experience. #10: Ethics of test preparations–for kindergarten http://bit.ly/6TG7Co > Man, I missed out on this for my 5 1/2 son!